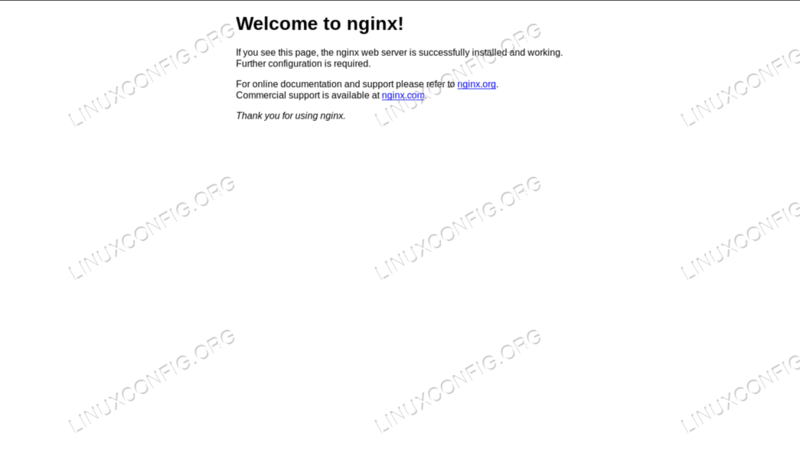 The Nginx web server, together with Apache, is one of the most known and used web servers in the world. It is generally less resource-hungry than Apache, and can be also used as a reverse-proxy. In this tutorial we will see how to install and configure the Nginx web server on Ubuntu 18.04 Bionic Beaver. The first command synchronizes our machine with ubuntu repositories, while the second actually installs the nginx package. Few seconds and the server will be installed on our system. The installation scripts will also take care of starting the nginx service. To make our server being able to serve pages to other machines we must setup the firewall to allow incoming traffic through port 80 (the default), and port 443 if we want to use the https protocol. The exact command to run to accomplish that, depends on the firewall manager in use on the machine, but here I will assume the ufw is running, since it is the default on Ubuntu. As you can see, the command above will give us an overview of the configured rules, indexed by number. The one above is a streamlined version (I just removed comments) of the default Nginx server block on Ubuntu 18.04. As you can see, each directive ends with a semicolon. The first thing we see inside the Server section, on Lines 4-5, are the listen directives. The first one is for ipv4 while the second for ipv6. Actually this could be shortened as listen [::]:80 ipv6only=off. The default_server directive sets this server block as the default one, meaning that it will be used if no other configurations match a requested name. This directive can be used only on one server block at a time. The root directive on Line 8 sets the path to the root directory for the site that will be served by the block: it's basically the equivalent of Apache's DocumentRoot. The index directive on line 11 defines the files that can be used as index. The files will be checked in order. On Line 13, the server_name directive is used to define the server name to be assigned to the configuration, and determines the server block that will handle the request. When defining the server name, it's possible to use wildcards and regular expressions. In this case, the value provided is _: this is used because is an invalid value, and will never match any real hostname (remember that this configuration is a catch-all). Finally, we have the location directive on Line 15: it changes the way a request is handled within the server block. In this case, the path to be matched for the instructions to take place, is /. The part of the uri to be matched is the one after the host segment. Inside the location "stanza", at Line 18 we can observe another directive, try_files: it checks the existence of files in the specified order, using the first found to fulfill the request. In this case, as suggested from the comment in the section, it first tries to match a file, than a directory. If nothing satisfies the request, a 404 page will be displayed to the user. Notice that the request is represented as the $uri variable, and what defines it as a directory is the trailing slash. Before we activate our new server block, we have the chance to verify that the default configuration indeed works as a default-catchall. If we now navigate to "www.example.lan" from the client machine where we just added the hosts entry, we can see that the server will respond to our request with the default nginx page (since the new block is not yet activated). With this command we generated a self signed certificate valid for 365 days, and a 2048 bit rsa key. The certificate and the key will be saved in /etc/ssl/certs/example-cert.pem and /etc/ssl/private/example.key files respectively. Just answer the questions that will be asked, paying particular attention when entering the FQDN: it must match the domain that will use the certificate for it to work correctly. Organization Name (eg, company) [Internet Widgits Pty Ltd]:Damage Inc.
As you can see we modified the listen directive at Line 2, using port 443 and also enabling the ssl parameter, then we added two new directives, at Lines 4-5: ssl_certificate and ssl_certificate_key, which points respectively to the certificate and the certificate key location. The alternative to self-signed certificates are certificates issued by a verified third party. While we can buy a certificate from a certificate authority, we also have the option to use "Let's encrypt!". "Let's encrypt" is itself a free and open certificate authority which lets us automatically obtain a certificate trusted by the browser using the ACME protocol and a certificate management agent which runs on the server. The only condition is being able to demonstrate that we have control over the domain we want to use the certificate for. Obviously for this to work the domain must point correctly to our publicly accessible server ip. Certbot will prompt us to answer some questions in order to tweak the site configuration, and if all goes well, the certificate and the key will be saved into the /etc/letsencrypt/live/ directory. Certbot will also apply the needed changes to the server block and reload the service. We installed the Nginx web server on Ubuntu 18.04, saw how to open the needed firewall ports, examined the default Ubuntu server block and created a custom configuration. 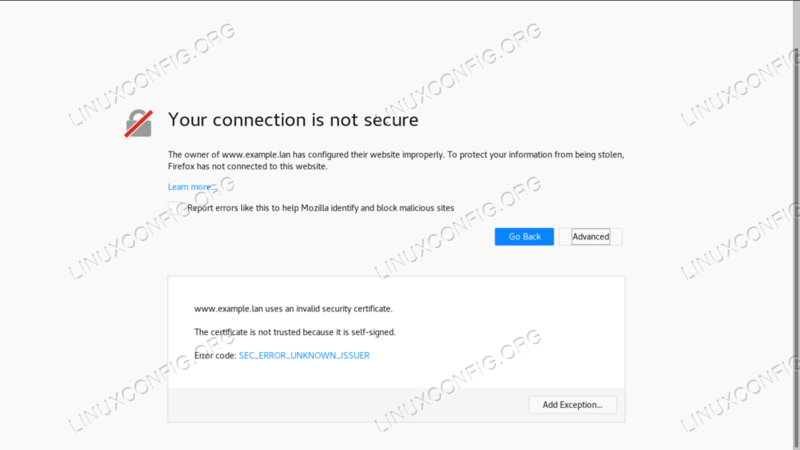 Finally, we generated a self-signed certificate and implemented the needed modifications to the server block to use the https protocol. As an alternative we considered implementing "Let's encrypt! ", which can provide us a recognized certificate with no costs. Don't hesitate to ask any questions, and visit the official Nginx documentation for more detailed information.